The Brong Ahafo Regional First Vice Chairman of the ruling New Patriotic Party (NPP), Kwame Baffoe, popularly known as Abronye DC has emphasized that no amount of insults from the office of former President John Dramani Mahama will stop him from exposing the wrongs and smelling deeds during the erstwhile administration. His comes following a statement from the office of the former President describing him as a knighted lair without common sense who goes about peddling all manners of falsehood to ruin his reputation. A statement from the office of the Mr. Mahama signed by Joyce Bawah Mogtari, a Special Aide to the Former President described recent comments to the effect that plush apartment had been rented for former AIDS Ambassador, Joyce Dzidzor Mensah in Germany to escape arrest for alleged embezzlement as pure fabrication. “It is a sad testimony, that a serial fibster such as Kwame Baffoe occupies a position of trust such as a Regional Vice Chairman of the ruling party. Such persons debase our political system and are responsible for the continued erosion of public credibility in our democratic dispensation”, the statement revealed. 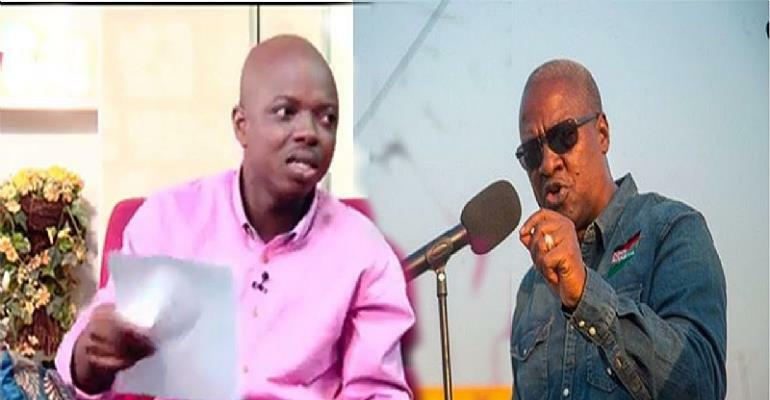 But NPP's Communicator in a statement has stated that the insults from the office of the former President John Mahama will not stop him from exposing the wrong and smelling deeds during John Mahama's era. "I would like to state clearly that, the insults from the office of the former president will not stop me from exposing the wrong and smelling deeds during his administration because I am a citizen, not a spectator", he opined. He emphasized that "Although I was surprised at the tone and intent of the letter, I think my worst fears have been confirmed by the office of the former president that, they still hold no respect for the good people of Ghana because not too long ago, he described Ghanaians as people with short memories and on one occasion, Mahama further described Ashanti's as ungrateful people and grumbles because according to him, even if he uses gold to construct their roads, they will still not appreciate". Abronye DC said he finds the press statement from the office of the former President as primitive and simply out of context because his statement failed to address the substance of what he said. '...I find the press statement from the office of the former president as primitive and simply out of context because the statement failed to address the substance of what I said but rather intended to calumniate my personality", he bemoaned. He added that "I was expecting the former president to speak to the matter and rebut the fact that, his wife Lordina Mahama has no connection or whatsoever with Joyce Dzidzor Mensah. Because as it stands now, all fundamentals indicate clearly that, Lordina Mahama instigated and aided Joyce Dzidzor Mensah to present fraudulent documents to the AIDs Commission for her to be appointed as AIDs ambassador even though she did not fall within the prerequisites of the commission". He dared "If the former president thinks he is clean and not associated with the fraudulent activities of Joyce Dzidzor Mensah, he should just produce her for prosecution and stop shielding her because I am optimistic the CID will soon arrest her from her John Mahama paid secret hideout and further prosecute her and all her accomplice". Although I was surprised at the tone and intent of the letter, I think my worst fears have been confirmed by the office of the former president that, they still hold no respect for the good people of Ghana because not too long ago, he described Ghanaians as people with short memories and on one occasion, Mahama further described Ashanti's as ungrateful people and grumbles because according to him, even if he uses gold to construct their roads, they will still not appreciate. Attached is the report or letter of the Ghana AIDs Commission to prove that, I didn't lie with the fact that, the lady deceived Ghanaians with fake documentations. Finally, I would like to state clearly that, the insults from the office of the former president will not stop me from exposing the wrong and smelling deeds during his administration because I am a citizen, not spectator.